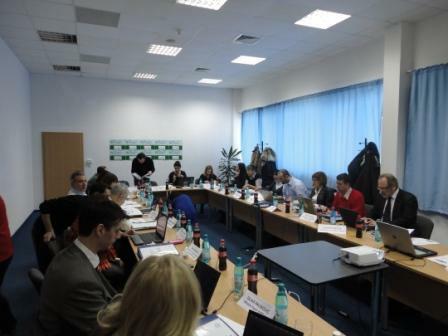 Kick off meeting for the FP7 project PROCEED was organized in the Arad Chamber of Commerce, Industry and Agriculture in Arad, Romania, in the last week of January 2011, where the Foundation M.I.R. participated as one of the project partners. The PROmotion and coordination of environmental research in Central and Eastern Europe for a sustainable Development with the support of the Enterprise Europe Network PROCEED project focuses on the communication and dissemination of environmental research results and practices originating in Central and Eastern European Countries (CEEC) towards industry, policy makers and public and private research centers (including Academia), with aim to enhance the uptake of research results and foster the participation of CEEC in EU – funded research projects through S&T cooperation with other European partners. The specific research sectors on which PROCEED will focus are Air Pollution, Chemical pollution, Environmental Technologies. The project partnership covers 9 CEEC (6 new Member States and 3 Associated countries) and 3 EU-15 Member states. All 12 project countries are represented by at least one partner member of the Enterprise Europe Network, which will be the main communication channel in the project, with its 600 members present in all European countries and beyond (China and USA) and an extended network of contacts and partners. The project is founded within the FP7 Cooperation Programe topic Environment.